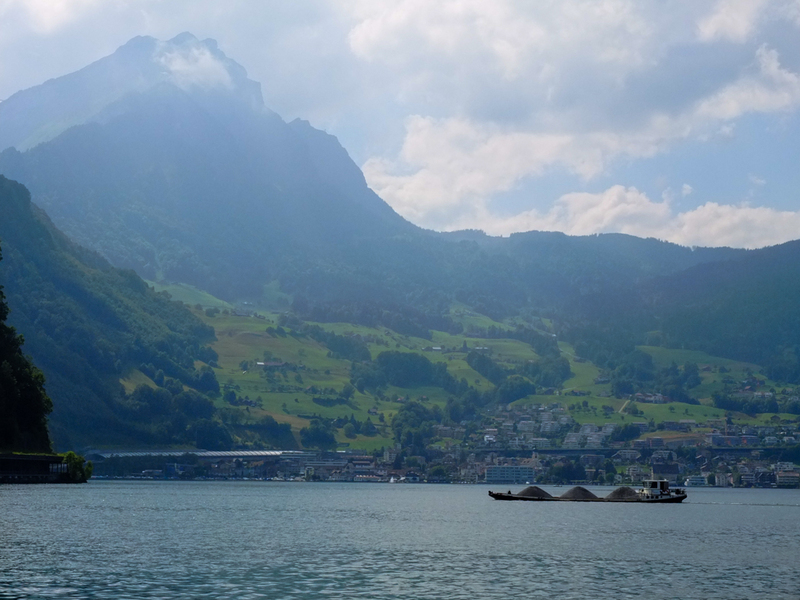 Surrounding Lake Lucerne are a range of mountainous valleys, which open up onto the Lake. The lake itself is large, and criss-crossed by steamboats and more modern ferries. It is also home to fleets of gravel boats, as the lakebed is being dredged for the material that is then shipped to the shore. I was enjoying a meal outside my hotel in Stansstad after a long day of meetings. It had a superb position on the shore of the lake, and I was impressed by the constant drama of the sky. The light was constantly changing, as clouds that had got trapped in the valleys were blown out onto the lake in front of the sun. The little gravel boats kept up their regular passage to the dredger, bringing back neat little mountains of gravel. I guess that at some point in the past, this stone was once part of a mountain range, like that which made a backdrop to the scene that was unfolding in front of me. What a lovely landscape you have captured here. Simply beautiful. Thank you Otto, I always try to pack a camera of some description on my business travels!